Against Islamophobia – or against freedom? This is another contribution to my argument (1) that, if one rejects the attempts of Jewish groups like the Anti-Defamation League to close down debate on the Israel/Palestine question by shouting “anti-semitism”, one cannot simultaneously try to help resolve issues by throwing the phrase “ Islamophobia ” around. You’re either politically correct, or you’re not. A New York synagogue invited a notorious anti-Muslim campaigner, Pam Geller. Jews Against Islamophobia (2) told the synagogue it should disinvite her, because “hate” is not really free speech. Actually, it is. 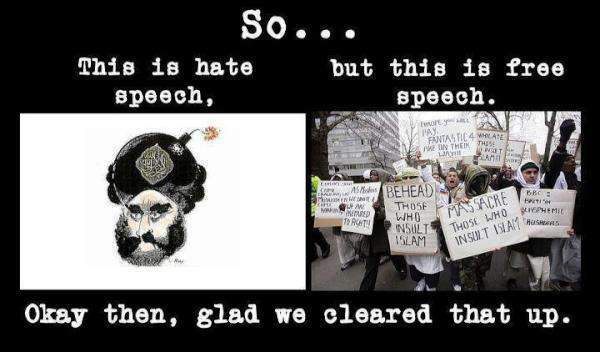 You invite someone to defend what you call “hate”, then you explain why you disagree with it. This is freedom of speech, a sub-category of freedom of expression, an important achievement of Western societies, enshrined in the first amendment to the U.S. constitution. Jews Against Islamophobia accepts that “the respected Southern Poverty Law Center” can “list” organizations such as “Stop Islamization of America”, as “hate groups”. This gives the SPLC the right to tell us what we can listen to. According to this, if any body other than a government one bars someone from speaking, it’s not a violation of their rights. This would mean that if Brooklyn College had barred speakers from the Boycott Israel campaign, it would not be censorship. Jews Against Islamophobia’s constituent organizations are among the ones who try to stop Gilad Atzmon from speaking – for example, some of them recently told a Portland venue that Atzmon is a “holocaust denier”, and it decided not to host him. The weasel words of the SPLC – “hate group”, “bigotry”, “racism” – are as easily used against Israel’s critics as against its fanatics. Why shouldn’t a synagogue invite Pam Geller to speak? It agrees with her view that the USA and Israel have a common cause against Islam. What’s the problem? It makes Jewish supremacists look bad? I commented on Mondoweiss criticizing Jews Against Islamophobia. To my amazement, my comment was not approved.